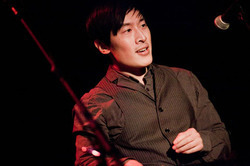 Michael Leong is the author of e.s.p. (Silenced Press, 2009), Cutting Time with a Knife (Black Square Editions, 2012), which won a FACE OUT grant from the Council of Literary Magazines and Presses, Who Unfolded My Origami Brain? (Fence Digital, 2017), and Words on Edge (Black Square Editions, 2018). His translation of the Chilean poet Estela Lamat, I, the Worst of All, was published by BlazeVOX [books] in 2009. He has also written several chapbooks including Midnight’s Marsupium (The Knives Forks and Spoons Press, 2010), which was an “Editor’s Pick of 2010″ by Stride Magazine; The Great Archivist’s Cloudy Quotient (Beard of Bees Press, 2010); The Philosophy of Decomposition/Re-composition as Explanation (Delete Press, 2011); Words on Edge, which won Plan B Press’ 2012 poetry chapbook contest; Fruits and Flowers and Animals and Seas and Lands Do Open (2015), which won the 2014 Burnside Review Chapbook Contest; and Police Lineups (Epigraph, 2018). His work has appeared in Drunken Boat, Hotel Amerika, Interim, jubilat, Lana Turner, Mandorla, Opium Magazine, Tin House, Verse Daily, and The &Now Awards 2: The Best Innovative Writing (Lake Forest College Press, 2013). His scholarly writing has been published in Contemporary Literature, Modern Language Studies, and Reconstruction: Studies in Contemporary Culture. A former NEA Literature Translation Fellow, he is Assistant Professor of English at the University at Albany, SUNY.